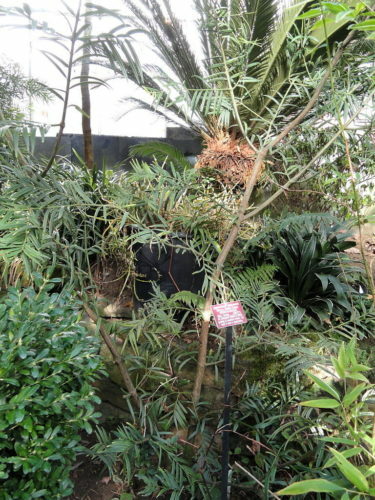 Amentotaxus yunnanensis, as described in 1952 by Li Hui-Lin, in A taxonomic review of the genus Amentotaxus. Journal of the Arnold Arboretum 33rd edition, is commonly known as Yunnan catkin-yew; as well as Thông tre vân nam and Sam bông in the Vietnamese language. It is a species of conifer in the Taxaceae family. The species name denotes China's Yunnan province where this species is endemic. Description. 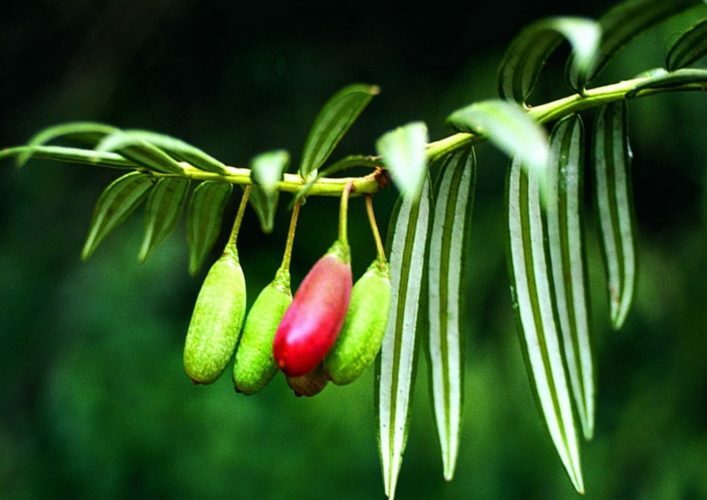 Yunnan catkin-yew is an evergreen, coniferous species of shrub or small tree that grows to mature heights of 50 feet (15 m) tall with a trunk measuring up to 10 inches (25 cm) in diameter, measured at breast height, with a wide, ovate crown. Bark is grayish to reddish brown, weathering to light gray. Twigs develop on opposite sides of branches. They have a smooth or slightly lined texture, green or glaucous in color, turning yellow, yellowish or yellow-gray after 2 to 3 years. Leaves are subopposite, arranged into 2 rows. Individual leaves measure 1.4 to 2 inches (3.5 - 10 cm long and 0.32 to 0.6 inch (8 - 15 mm) wide, with narrowly lanceolate or linear shape, straight or curved (sometimes s-shaped) on upper part, obtuse or pointed with subrounded or broadly cuneate bases. Margins are slightly revolute. Midribs are evident above and flat beneath, two bands of stomata on both surfaces. Stomata are usually white or gray in color, measuring 0.08 to 0.16 inch (2 - 4 mm) wide. In leaf-buds, band of stomata are often narrower. Seed cones grow spike-like, with 4 to 6 spikes at the branch-tips, each measuring 4 to 6 inches (10 - 15 cm) long. Each stamen bears 4 to 8 anthers (usually 6 to 7). Fruit is often solitary on the annual branches, growing downcurved Seed cones have an ovate shape, measure 0.88 to 1.12 inches (2.2 - 2.8 cm) long and 0.56 inch (1.4 cm) wide. Pericarp is violet-red in colorwhen mature, and slightly covered with white powder. Stalk stout and 0.6 inch (1.5 cm) long. The lower part is flat and the upper part quadrangular. Distribution. This species is native to Vietnam and southern China (Yunnan). In Vietnam only found in primary forest of Lao Kai province, growing at elevations above 2,300 feet (700 m) above sea level on Hoang Lien Son mountain. It is a humidity-demanding tree, shade-tolerant when young and tolerates low temperatures. Usually mixed with Chamaecyparis hodginsii or Podocarpus neriifolius. It grows on the limestone hills of southern China (southwestern Guizhou and southeastern Yunnan) as well as northern Vietnam. Remaining populations are small and threatened by logging. Attribution from: Forest Inventory and Planning Institute; Vietnam forest trees; Agricultural Publishing House. Hanoi. 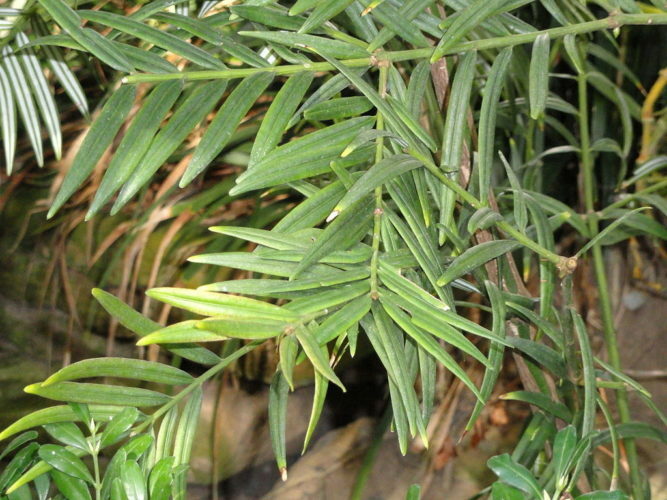 Amentotaxus yunnanensis — a closeup of foliage and seed cone detail.